As the weather warms up, bring out your creative side with fun, spring cocktails from Santa Margherita. This delicious wine is perfect on its own and as a base for delightful cocktails. 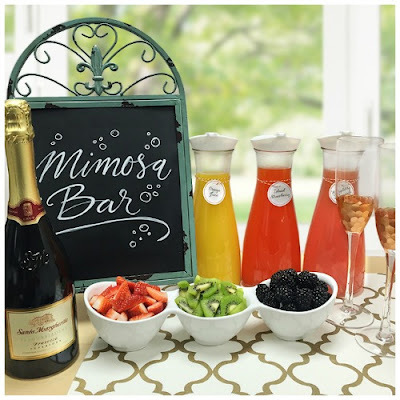 Plus, for those of you who want to throw a party, we've got their instructions on how to do a DIY Mimosa Bar and for their Spiked Fruit Cubes! Let's get the party started! Blend cups of confectioners' sugar, mint and lemon together in a blender until smooth. Chill in refrigerator for 10 minutes. Divide the mixture into glasses to add extra sweet flavor. Pour Santa Margherita Prosecco Superiore into each glass, stir. Top with selected juice. Garnish each glass with fruit. Fill ice cube trays with sliced fruit. Carefully pour Santa Margherita Pinot Grigio Alto Adige over the fruit to fill tray. Freeze for 4-6 hours and serve in a glass with chilled Santa Margherita Pinot Grigio Alto Adige. Disclosure: You must be 21 years of age or older to consume alcohol. Please drink responsibly. I like both of these recipes. They would be so nice and refreshing. 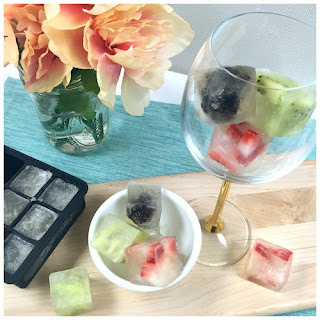 I think my favorite is the Spiked Fruit cubes.